Saint Mary's Stadium, Southampton, England. Southampton limited Chelsea to a draw following a resilient display through to the full-time whistle at St. Mary's in a captivating encounter. Despite Sadio Mane giving the hosts an early advantage, a sublime strike from Eden Hazard would put the game back on level terms. Chelsea would then proceed to throw all they could to find a winner, but even going down to ten men, they held on. With fatigue compiling from the demanding Christmas schedule, Chelsea started conservatively but with means to dictate the game. Eventually, Southampton found themselves under siege as Mourinho's side looked to expose their vulnerabilities—including left-back Matt Targett making his first start for the Saints against the league leaders. Majestic dribbling from Cesc Fabregas saw the Spaniard evade numerous defenders only for the ball to be desperately hurried by Fraser Forster. High pressure was employed as an ingredient for the Blues to take an advantage, but they also kept watertight security upon the goal of Courtois. Graziano Pelle was cut out by an alert John Terry. Ronald Koeman's team managed to weather the early storm then would stunningly seize the initiative. After a few positive minutes, a searching ball in would be missed by the awaiting Chelsea defenders, and Sadio Mané pounced on the opportunity. Tadic guided it on after the ball was hoofed up field, and then Mané would head it on to control the ball before lobbing the bouncing ball over Courtois to fuel euphoria from Saints' fans. Time and time again, Cesc Fabregas was able to breach into the box through the left and deliver some dangerous balls. The hosts remained resilient and still looked to further barrage on an uncharacteristically tentative Chelsea back-line. Elsewhere on the pitch, however, things were looking positive. Chelsea almost spent a minute in the box passing the ball, awaiting for a chance to open, but when Diego Costa's heavy touch lead to a clearance, the Blues were yet to register a single attempt on goal—whereas Southampton had 4. As the evenly-poised first half continued to ensue, Eden Hazard would bag a crucial goal on the stroke of half-time. A swift move saw Fabregas lob it over to his Belgian teammate who still had plenty to do. Hazard cut inside, skipping past Yoshida, before arrowing into the far corner for a classy equaliser. It meant that a thoroughly entertaining first half concluded 1-1. Chelsea set out with intent to break ahead of the game, however with Southampton pushing the physicality that would prove a hard task. Cesc Fabregas' dribbles down the left continued to play a factor, although on disciplinary times both sides were at fault. The game was still an entertaining one although it had lost a lot of the sting from the first phase. Targett, the young debutant, appeared to trip Fabregas in the box minutes later, although the referee did not rule it a penalty when the Spaniard was taken down inside the area. Although frustrated at the call, Chelsea continued to bombard and dominate the final third. One of the most deadly duos throughout the contest was Hazard and Fabregas. This time, Fabregas lobbed the ball to his Belgian teammate, who controlled the ball on his chest before trying a volley which went astray of goal. Chelsea were finding their grove, dominating possession right after the hour mark. It remained even despite sublime link up by Chelsea as they swarmed the box. Oddly, it was they who couldn't find a cutting edge and the likes of Hazard and Costa seemed reluctant to really let fly at goal. 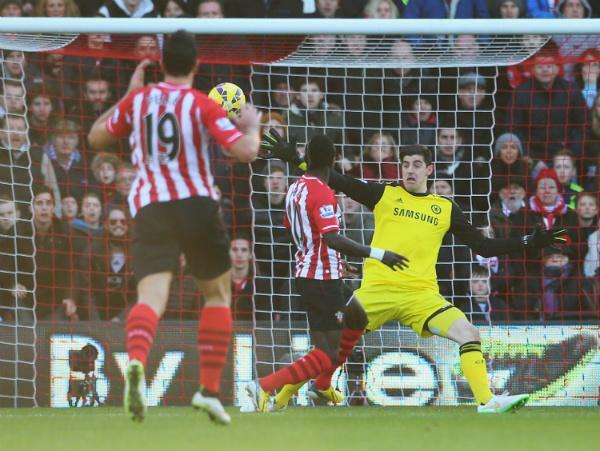 Southampton were being forced to work really hard in chasing down every way possible. They struggled to find quality as a result when responding on the attack. 70 minutes in, it was all to play for. Volatility continued to increase. James Ward-Prowse was under pressure and looked to pass it back to his keeper, but Diego Costa was awaiting. Fortunately for him, a slip-up by the Chelsea hitman saw him squander the huge opportunity. Southampton continued to clear, at times with panic, but after 80 minutes it remained 1-1, credit to the resilience of Koeman's men. It remained a conundrum for Chelsea to solve if they were to find their way through. Targett cleared, Pelle accidentally headed it back in towards Filipe Luis, and the ball would come back to the hands of Forster as the long half wore on. Relief was nearing, though. Following another Saint's corner, there was a twist to the tale as Schneiderlin received a second booking for a foul on Fabregas. Southampton had a lot of work to do with the visitors holding the cards and trying to find the winner. Wonderful play by Eden Hazard saw the 10 reach a yard and drill in a low cross, but it couldn't find Didier Drogba. They needed more of that as their search went on. Soon after, Hazard let the ball run to Filipe Luis, whose shot on the turn was blocked. Breaking on the counter, Pelle was cut out for a throw. Hazard and Fabregas were spear-heading the attacks as they fired on all cylinders. Fabregas fired across goal to Luis, but it couldn't find anyone to effect. Deep in stoppage time, the game was on a knife edge. Shane Long was fouled in the attacking half, and Sadio Mane was dispossessed from the corner looking to hold out the game. Chelsea were awarded a free-kick in a last attack and it was down for one more delivery into the box. It wouldn't be the last one though, as the ball came back out to Hazard who was fouled. The ball trickled out to a corner, the final whistle blew and in their third draw of the season, Southampton had kept the venom of Chelsea at bay. Heroic by Southampton. They hold Chelsea to a draw and finish 2014 on a high. 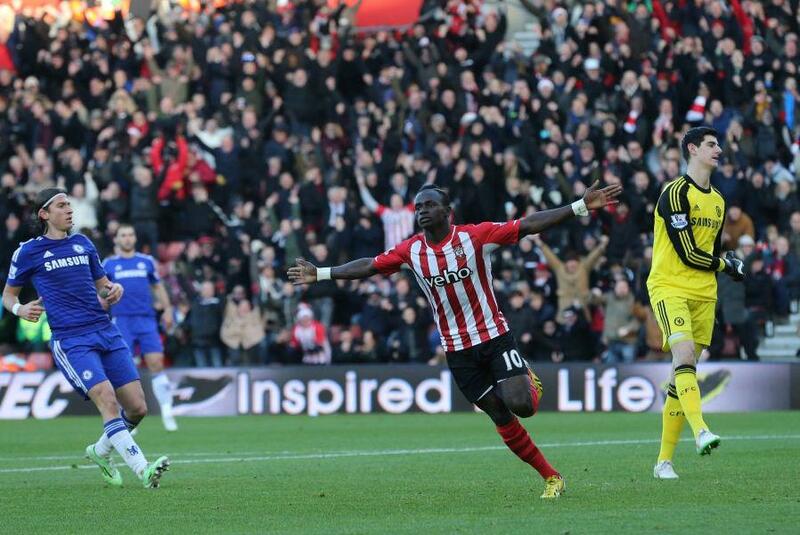 A complete match report for Southampton vs. Chelsea contested in the Barclays Premier League on Sunday 28 December 2014.